ssExcelPivot class is among my underrated or maybe I can say the most underrated class of _ssClasses library. But this is in fact one of the best and useful class I have created so far. After I created this class, creating top managerial reports has never been soooo easy for me. What does this class do? 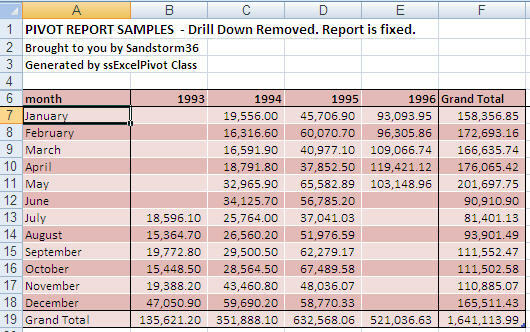 It creates 12 sample pivot reports in Excel (in my sample) just to show how things can be easily done. However, you can create more than that, even hundreds of different format, styles, etc. 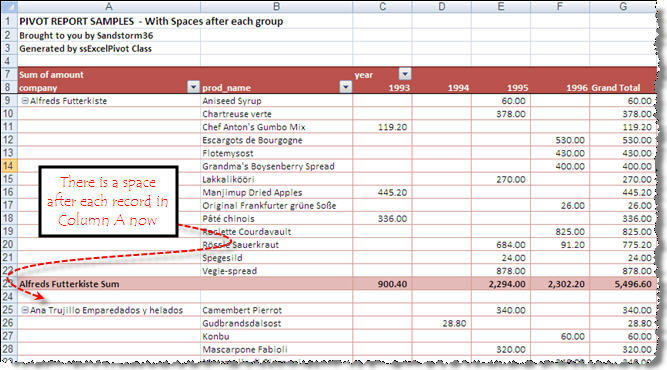 At the very bottom is Create Your Own Report which allows user the ability to create a pivot report in excel of their own choosing. 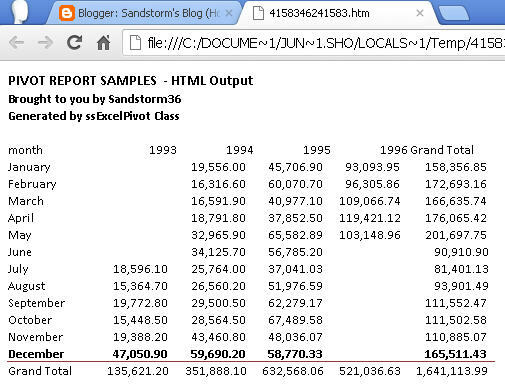 "|Brought to you by Sandstorm36|Generated by ssExcelPivot Class"
And as you have seen, a new report is generated simply by changing values of properties such as _rows, _columns, etc. Presto! An entirely new pivot report. You cannot simply do that with any crosstab utilies or via creating an frx. Those will involve a helluva lot more work for you! 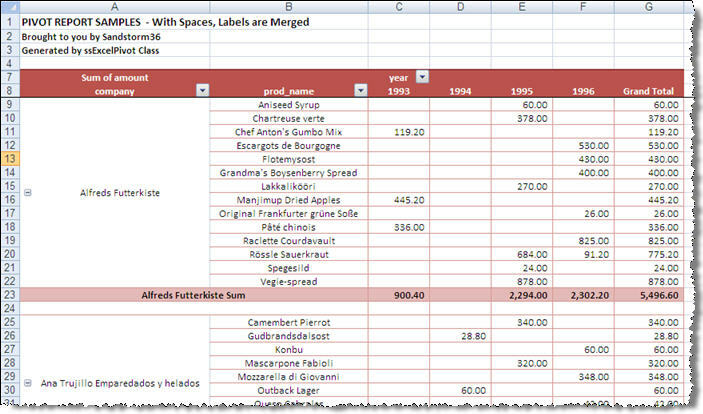 Just to spice up more our pivot reports inside excel. 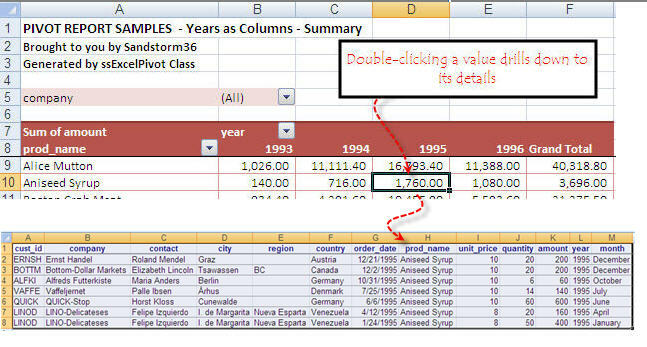 When you drill-down via double-clicking a value, a new sheet will be created for you. 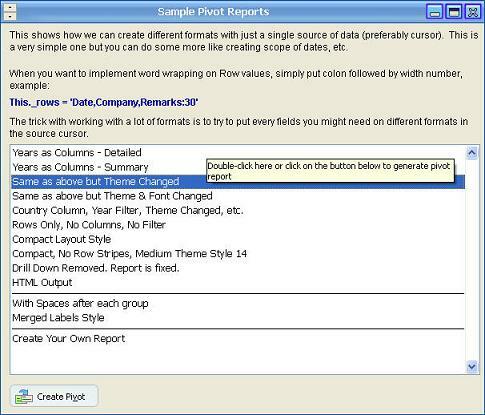 To go back to the report, simply click on the sheet named PivotReport. Further, you can also morph the report on the ply based on what you desire by filtering, dragging rows, adding more rows, changing columns, changing calculation types, etc..... until you get satisfied with the new format. Moreover, you can create charts based on the current pivot report output easily. Or make some adjustments like fitting reports to 1 page, etc. That is because you have the whole excel capabilities under your hands. Again, all of those features are not available with native VFP reports as well as any crosstab utilities out there I knew. For instance my boss will call me over the phone saying "Hey Jun! Can I have a report of items purchased within these period?" and all I will say is "Yes Sir!". Report is done and emailed within a minute or so if I still have to create an SQL SELECT otherwise it can be done in seconds. Then my boss may again ask, "can we see only purchases of this department?". And all I need to do is employ filtering on departments from within excel report itself then send again another email. Filtering can be done on Filter field, Rows and Columns. You can employ several filters. On his end, if he wants to see any detail, a simple double-click to activate the drill down feature is needed. 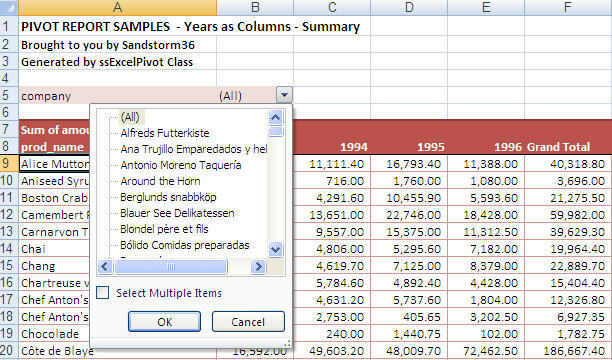 While this post is about ssExcelPivot class, I am trying to relay the fact that an Excel Pivot, either done via my class or an excel automation or manually; is really a very powerful report. I hope you see the benefit of this report type as I do. Cheers! The Best Excuse Letter Ever!! !